I've been keeping a lookout for new paper cuttings from Ruth Mergi. She was already doing exceptional work when I first interviewed her a few years ago, although she had been seriously working as a paper artist for only about a year. American-born Ruth has continued to hone her craft from her home studio in Modiin, Israel while raising a young family. This is an example of one of her recent custom pieces... a layered, hand painted marriage ketubah - exquisite! The ketubot available in Ruth's Etsy shop are original, hand cuttings reproduced by laser on fine art paper. A couple's desired Hebrew text is giclée printed using digital technology. Ruth describes this damask-patterned ketubah as a modern classic. She shows new lace, lines, and Moroccan ketubah designs too. Ruth's cuts are mind boggling indeed; sometimes she stacks many layers to add to the impact of a piece. More new work is a series of hand drawn and scalpel-cut geometric tessellations with large forms in the center that become infinitely smaller toward the edge. This type of hyperbolic pattern appeals to her because it is ever-present in nature. Stay up-to-date with Ruth Mergi via Facebook. Ruth's work is simply amazing! I am excited to be going to be going to the opening night of her show. Lisa, that's great! I would LOVE to be there and meet all of you in person. The layered pieces are tremendous. Gorgeous work! Wow. I'm speechless. Her work is incredible! From the first moment i saw her hand works, i was so jealous... she is so talented and for sure i will be in her first ever exhibition. Her layered paper cuts took my breath away. She is truly a genius. WOW, she is incredible!!! Those are so beautiful. Have a great day, dear. superb colors and beautiful so beatiful! ruths cutouts are just so inspiring.....makes me want to give it a go! i the delicate lacey pieces....they are my favourite. 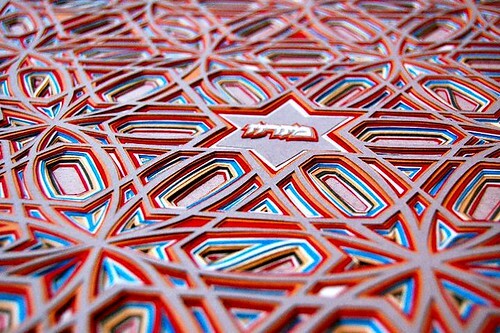 What a fantastic paper cutting artist. The patience that is needed to create this type of art is beyond me!